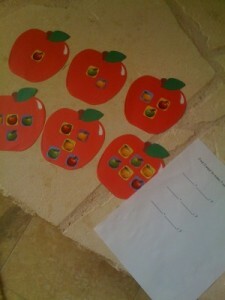 This was one of my favorite math activities to do with Andrew when he was building basic addition knowledge. It is really such a simple idea but was always a hit with him because it was always different whether by theme or the number he was to find. The object of the game “Make This Number” is to combine two cards to create a specific number. I like to think of this as beginning algebra because I provide the answer (the given number) and one of the addends and he has to figure out what the other addend is. He used the stickers to count or you could also provide some manipulatives to help (red cotton puffs would be perfect for this theme). Directions: Combine the cards to make __. There will be 3 pairs. The station activity pictured below is set up for him to combine the cards to make 7 (My apologies for the poor photograph. This was taken a few years ago before I knew how to shoot them so they show up well.). I set out the cards 1-6, knowing that when paired they will make 7. 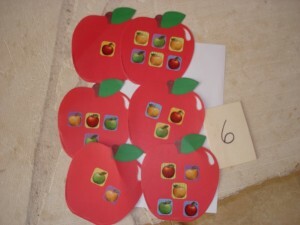 My Obstacle Course Station Activity: Apple Themed "Make This Number"
Andrew worked through this and found that pairing 1 and 6, 4 and 3, and 2 and 5 would each give him 7. Station completed with cards matched up to make the number 7. I love this activity because it really helped Andrew to build a strong foundation of addition facts (and even subtraction because he had to figure out what was missing). Using the cards 1-9, you can help your child build math facts up to 10. Extension: I will do a post on this because this is something I am going to do for Andrew but will give a blurb here for those that are ready. This could also be done using calendar numbers for building multiplication facts. Provide the number and the child has to match up the pair of factors (the numbers multiplied together). Ex. For the product (answer in multiplication) 24, I would set out 1, 2, 3, 4, 6, 8, 12, and 24. Once I knew they had the idea, I would also probably throw in a number that does not fit, kind of like an oddball to see if they could figure it out.